This Scania S-730 was spotted on a trailer without any camouflage. The badge says S-730 but it is a construction truck with an 8×8 configuration. 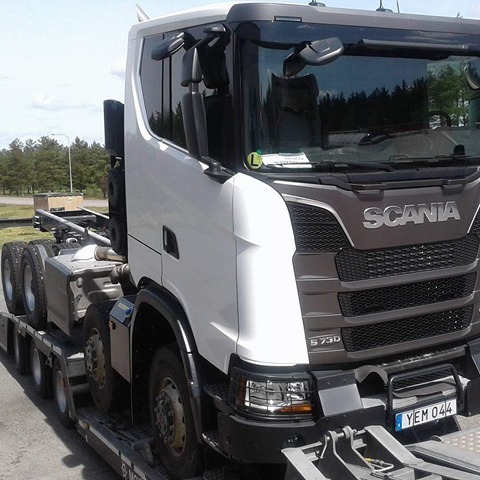 The cab sits high above the road with the driven front axles, especialy this S- cab with the flat floor. The truck is equiped with the lowest roof available. The front bumper is a real construction bumper with a central towing point and a steel plate. Also the headlights have protection against stones. When we look at the chassis there is a rather strange exhaust damper. This looks like a prototype to me. Also between the two front axles there is something that looks like an AdBlue tank. Behind the cab we see airfilters.